"We love traveling with a group of couples. The camaraderie, laughs and great times had as a group just enhance the overall experience. Its a wonderful opportunity for us to have a big dinner and a ton of fun a few nights during the trip as a group. It's just the right balance between privacy and group fun." There's a good chance that you won't be able to make one of our hosted trips, we only go once per year. That's ok! We're here to help you plan a trip and outfit you with the right information, flies, and tackle for putting together a great trip. 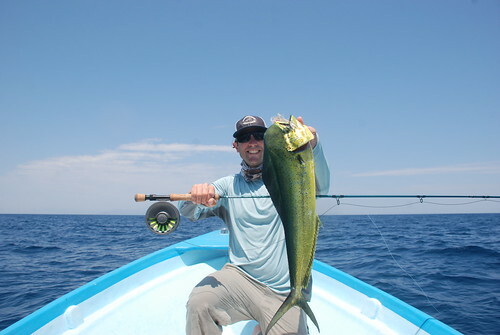 Contact Joe Rotter, joe@redsflyshop.com, for information on fly fishing in Baja. We can recommend the right flies, gear, and tackle for this trip. We would love to refer you and help you do it right! This is a fun, affordable, and diverse mix of fly fishing, resort life, eco-tours, wildlife viewing, and some conventional tackle fishing. This trip is formatted to give you the right mix of social interaction combined with a special vacation with your partner. Fishing times are 6 am - 2 pm, so there is plenty of time to have fun and relax every afternoon. The common itinerary has the guys fishing 4 days, gals fishing 1 day while sharing the boat with another couple, double date style. Gals are welcome to fish as many days as they would like for a minimal up-charge (extra lunch, drinks, and tip). Couples that want to fish together every day with their own guide/boat are subject to additional fees beyond the standard rate. You may elect to whale watch, visit the sea lions, snorkel, or simply tour and relax. It's your vacation. You decide. We have arranged to stay at the nicest hotel in Loreto. While there is a great restaurant at the hotel, it is a short walk to the main plaza for other restaurants and shopping, and also the marina where we meet the fishing boats. Rooms are based on double occupancy (one couple per room), and all rooms are ocean view suites. ARRIVAL DAY: Meet outside the airport in Loreto, meet our driver from La Mision Hotel, check into hotel, orientation over cocktails, dinner as a group that evening. DAY 1: Fish 6 am - 2 pm; Significant others (SO's) can accompany or stay in. Massage (schedule when convenient), pool 2 pm poolside group happy hour, dinner. DAY 2: Fish 6 am - noon then meet the group at Coronado Island for private beachfront Happy Hour! SO's accompany fishing boats this day. Return to Hotel 2 pm, dinner. DAY 3: Fish 6 am - 2 pm or stay in and explore shops in Loreto, sit by pool, take the massage.... poolside group happy hour, dinner. DEPARTURE DAY: Checkout at 11 am, lunch, shuttle to airport. One day we'll quit fishing early (noon) and meet at Coronado Island for a group happy hour! DIY Margarita bar arranged by your host. 1 massage per couple at the hotel. Schedule it anytime during the stay.